The Air Council assembled in the foyer of Adastral House, London, on the occasion of a visit by Field Marshal Smuts. 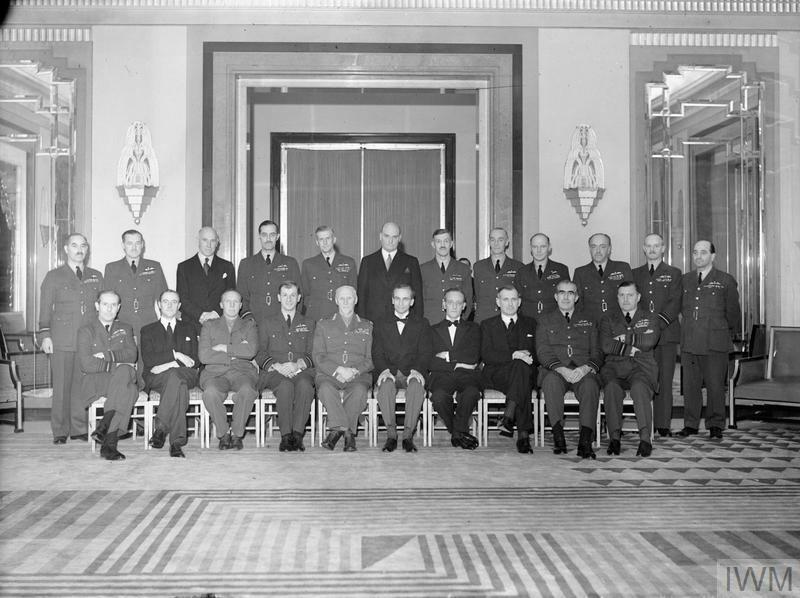 Left to right, (seated): Air Chief Marshal Sir Philip Joubert de la Ferte, Air Officer Commanding-in-Chief, Coastal Command; Lord Sherwood, Parliamentary Under Secretary of State for Air (Lords); Captain J D Smuts; Air Chief Marshal Sir Charles F A Portal, Chief of the Air Staff; Field Marshal the Rt Hon J C Smuts, Premier of South Africa; the Rt Hon Sir Archibald Sinclair, Secretary of State for Air; Mr S F Waterson, High Commissioner for South Africa, Captain the Rt Hon H H Balfour, Parliamentary Under Secretary of State for Air (Commons); Air Chief Marshal Sir Christopher L Courtney, Air Member for Supply and Organisation; Air Chief Marshal Sir Sholto Douglas, Air Officer Commanding in Chief, Fighter Command. 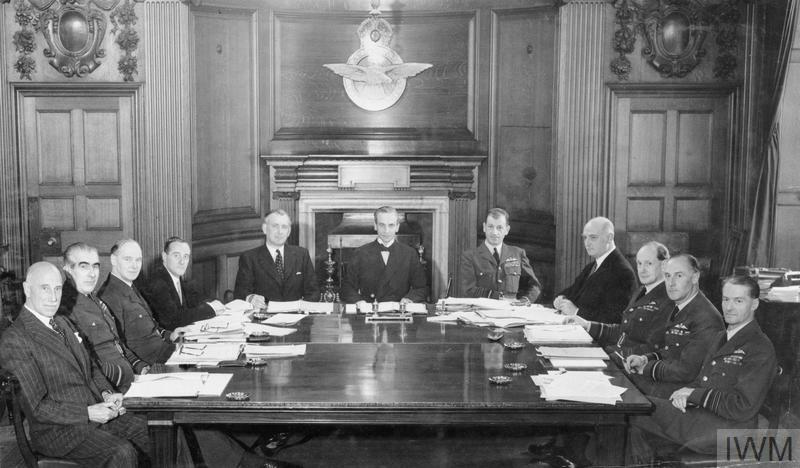 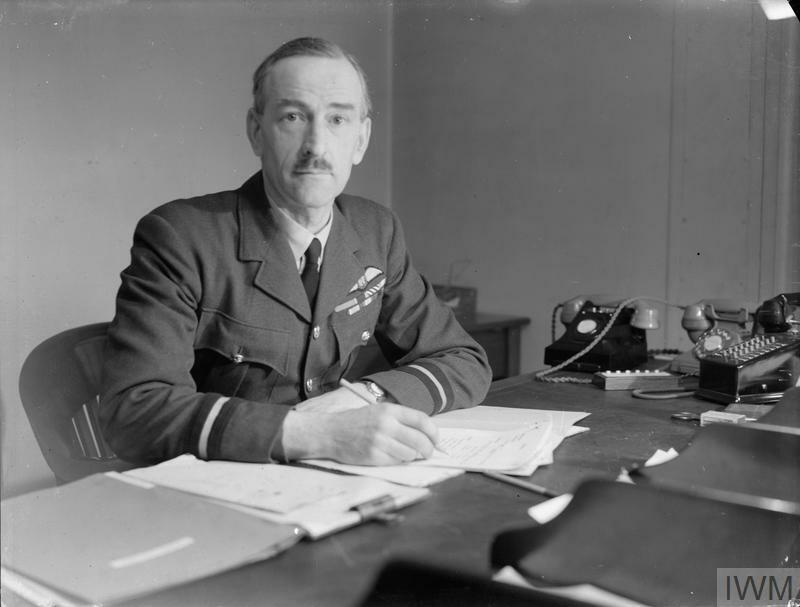 Left to right, (standing): Air Marshal A G R Garrod, Air Member for Training; Air Marshal Sir John T Babington, Air Officer Commanding-in-Chief, Technical Training Command; Sir Harold G Howitt, an Additional Member of the Air Council; Air Marshal F J Linnell, Controller of Research and Development in the Ministry of Aircraft Production; Air Chief Marshal Sir Edgar R Ludlow-Hewitt, an Inspector General of the RAF; Sir Arthur Street, Permanent Under Secretary of State for Air; Air Marshal P Babington, Air Officer Commanding-in-Chief, Flying Training Command; Air Marshal D G Donald, Air Officer Commanding-in-Chief, Maintenance Command; Air Marshal Sir Bertine E Sutton, Air Member for Personnel; Air Marshal Sir Arthur S Barratt, Air Officer Commanding-in-Chief, Army Co-operation Command; Air Marshal Sir Leslie Gossage, Air Officer Commanding, Balloon Command; Air Vice Marshal C E H Medhurst, Vice Chief of the Air Staff.